After three long years, the wait is finally over! I got a chance to check out some of the single-player levels in Killzone 2 last week. Should you get excited? I've already seen a bunch of videos floating around on the ‘net, so when I sat down and got my hands-on time with Guerrilla Games' much-anticipated shooter, the graphics weren't a priority on my check-list to see. I knew the game looked good. Once I saw it running on a high-def television, though, it was hard for me not to drool a little. But my main interests this time were the controls and combat. I played through the opening level where the ISA troops are sent in on dropships to the Helghast home world, fittingly called Helghan. This has been demoed heavily before, where the main objective is to destroy the lighting gun at the end. I thought the controls themselves took a while to get used to, particularly remembering which two shoulder buttons were used for hugging the wall and throwing a grenade. Maybe it was my FPS rust showing. Let's just say my follies early on provided some hilarious outcomes when I tried to hunker-down with my teammates. Speaking of teammates, they do a nice and subtle job of letting you know what to do and where to go if you get stuck somewhere. Back to the controls. I also thought the aiming wasn't as precise as I would have liked. This is mainly due to the fact the ISA M82-G (the weapon you start with) is the most accurate assault rifle I got my hands on. 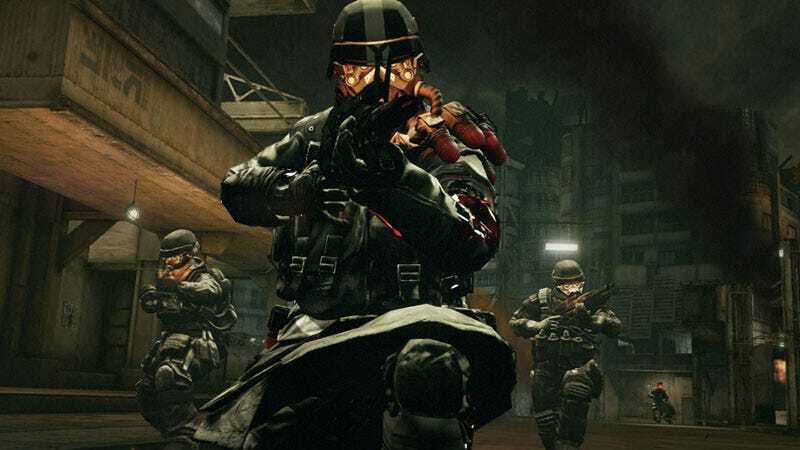 The Helghast weapons were, for the most part, useless, especially against the mid-boss fight against the heavily armored Helghast trooper with the mini-gun that you have to shoot in the back. I could never aim where I wanted and I found myself having to really take my time, which caused me to die a lot. This will probably remedy itself once I get to play it more, though. If you played the first Killzone, you'd know the series wasn't known for jumping. In fact, there was no jump button at all. But Killzone 2 does include the ability to jump (hooray!). However, in the levels I saw, I really didn't see a need for it. Something that disappointed me was, yes, the game does a great job of mimicking a "real war" environment and atmosphere, but you can't really go anywhere, as the levels felt very linear. I couldn't jump over a small barbed-wire blockade or leap off some railings, as the game puts up those dreaded invisible walls. Oh, oh, almost forgot to mention the Sixaxis controls. There are situations where you have to rotate the controller to open doors. These are not optional. I actually got stuck here for way too long. Having to open the valve on a door requires you to push and hold the button then turn the controller, then letting go and repeating. There wasn't any really on-screen guide to help me, either. Anyway, I minor nitpick. The combat itself was, overall, really satisfying. There were situations where I felt I was safe, but got flanked by a group of on-coming Helghast from the side. You have to really pay attention at times. They also love to throw grenades if you spend too much time hiding. The cover system makes for some great firefights, too, as the there is never a shortage of things to duck behind. I didn't find myself using it as much as I predicated early on, but you will when you start facing more powerful enemies, such as the snipers, you will fall in love with the L2 button. Also with first Killzone, you had the option to choose from four characters, each with different weapons and abilities. You only play as the same lead role (Sgt. Tomas Sevchenko) the entire game for the sequel. Not that this is a huge problem, but something I enjoyed about the first game was being able to replay levels and find new, hidden routes using each of the character's unique abilities. Not so in Killzone 2. I was told the single-player campaign will take somewhere between 10 and 12 hours to complete. The Sony rep there also mentioned the review code hasn't even been sent out yet. Taking that into consideration, the game is extremely polished. The only real hiccups I noticed were some chugging and skipping going on when the next section or cutscene in a level was loading. Also, the load time between each level was a bit too long for my liking. But other than those, the framerate is solid (thank god!) and, of course, the graphics and effects look visually stunning. Still, with these in mind, this is shaping up to be the Sony's best FPS ever. Only two more months of waiting!